… but is coming up short. Names can be many things. A descriptive label, a pigeonhole, a statement of intent. It’s therefore striking that Islington restaurant 1251 has such an easily forgotten, easily misremembered name. It may have some significance to someone behind the scenes, especially in light of the fact that chef James Cochran couldn’t use his own name due to a Kafkaesque trademark row (which also stands as a stinging indictment of British intellectual property law and late-stage capitalism in general). For the rest of us, 1251 could mean anything from the PIN for Cochran’s bank card to the amount of money spent on branding consultants or a milestone date in the history of the Holy Roman Empire. As the name of a restaurant, 1251 gives the impression of muddle-headed nothingness or enigmatic aloofness at best. If you opt to have the tasting menu, you’re ushered to the upstairs of the narrow premises. If you choose to order a la carte, as I did on all my visits, then you sit downstairs in surprisingly unmemorable surroundings. 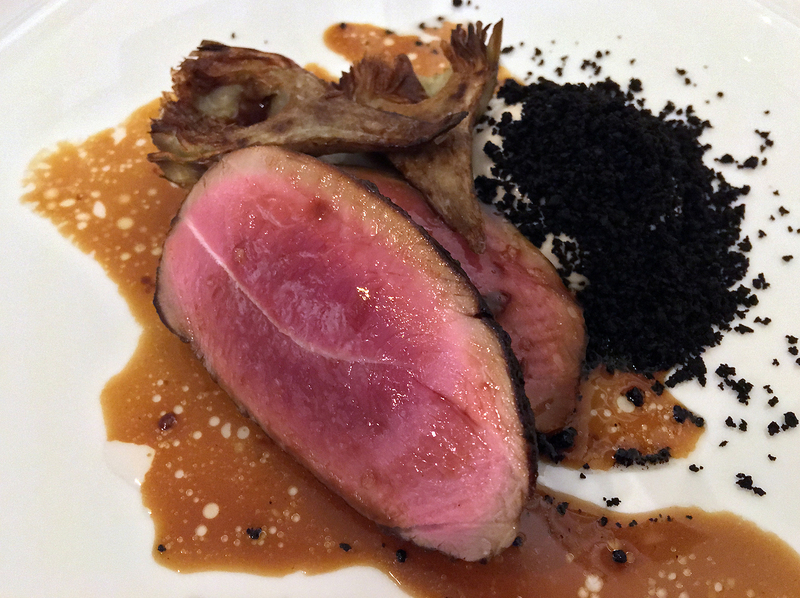 Despite not having the tasting menu, its existence is still notable as it explains the small-ish portion sizes of the a la carte dishes. Such skimpy serving sizes make sense in the context of a typical multi-course tasting menu where it all adds up to be quite satisfying (surprisingly so for tasting menu neophytes). They make far less sense when ordering only three or four dishes a la carte. To put it another way, if you’re having dinner at 1251 then don’t have a light lunch on the same day. Cochran is a veteran of garlanded London eateries The Ledbury and The Harwood Arms (a fact I wasn’t aware of until I started proofreading the final draft of this review). The precise sophistication of the former and the deceptive simplicity of the latter were evident in dishes such as the hake. The meaty yet light flakes of fish had a subtle yet still distinctively flavoured jerk crust. Although its spicing wasn’t robust enough to really need the refreshing qualities of the umami yoghurt or the tart, almost quince-like pickled watermelon, this nuanced layering of flavours was still nonetheless remarkable. Insert joke here about Jamie Oliver being a jerk about jerk. Fried rabbit was much like fried chicken, but with a batter of uncommon quality. The lightly crunchy and oil-free coating had a sweet maltiness to it, a pairing of texture and flavour that dilated my pupils and set my arm hairs on end. Sadly, this superlative beginning wasn’t matched by the quality of the meat. The rabbit was far too tender and chicken-like, losing the bouncy firmness that, at its best, sets that meat apart from its poultry counterparts. The sauces were too transient to have much of an impact. This dish began with a bang and ended with a whimper. A far better testament to 1251’s handling of meat was a dish combining pork, black pudding and eel. The rich fattiness of the smoked eel was the perfect counterpart to the dense sweet woodiness of the pork. 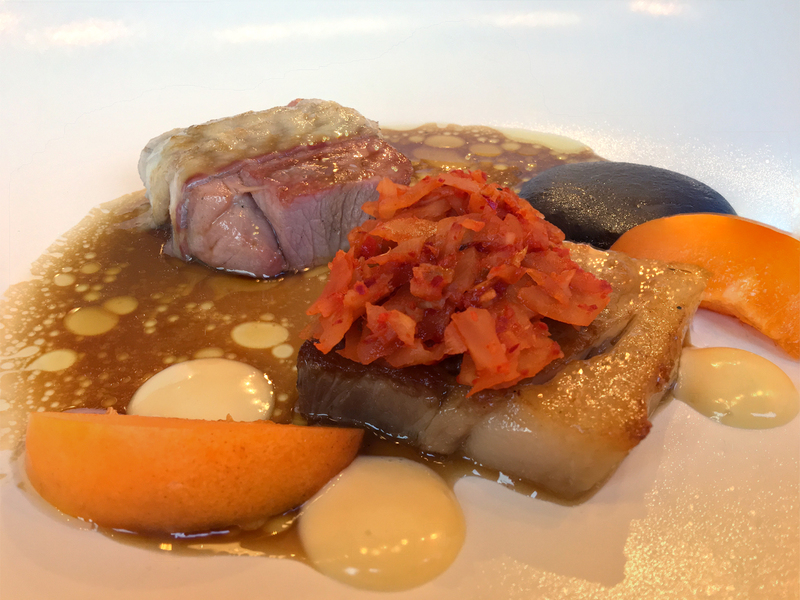 Tart kimchi, a puree of black pudding and an umami jus bound sea and land together. Only the sweet apricots stuck out like sore thumbs in an otherwise perfect composition. 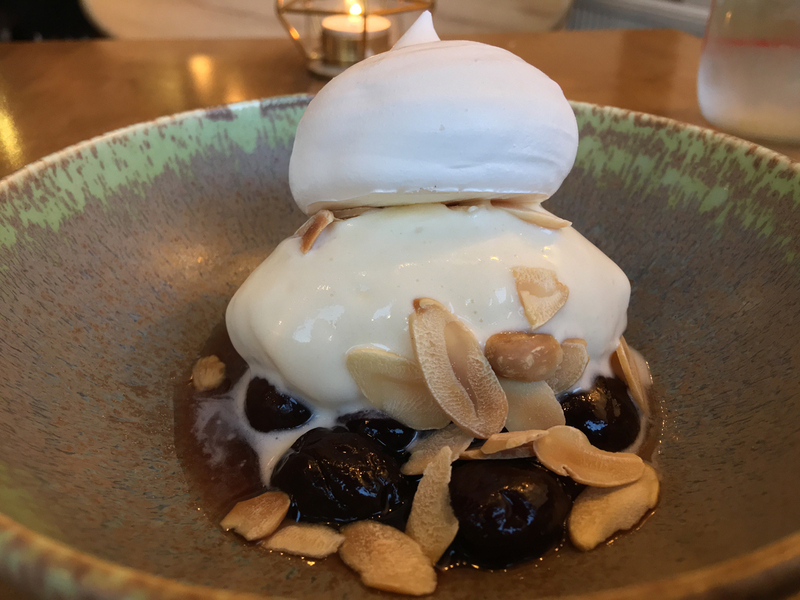 Although it received star billing, the large and unwieldy ‘frozen’ meringue was the least interesting part of a dessert that saw sour cherries and nutty almond flakes joined by a smooth, refreshing ice cream. A classic combination that made for an eminently satisfying dessert, inspite of the oversized meringue. It’s funny how some distance makes everything seem small. 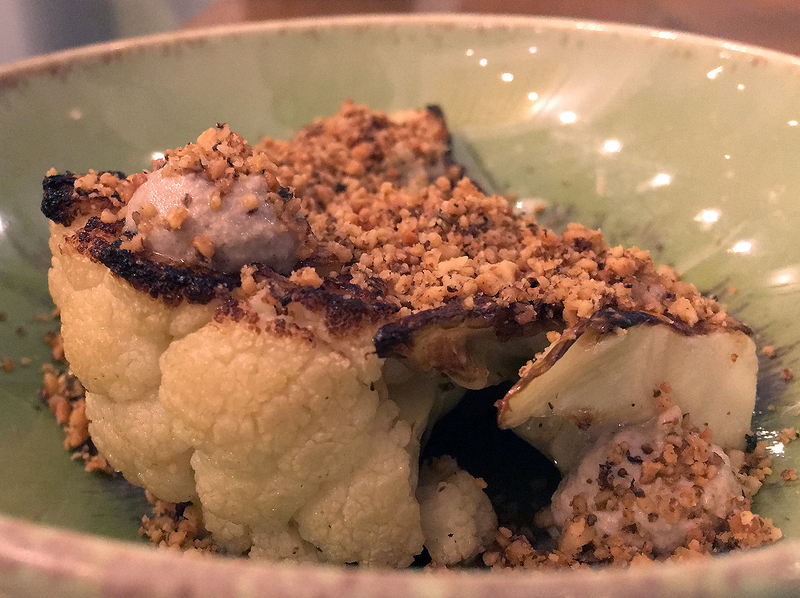 Confit cauliflower provided a firm canvas for a surprisingly complimentary pairing of pungent fish paste and a dusting of crushed nuts – a potent flavour combination. A cauliflower dish that I can fully embrace. 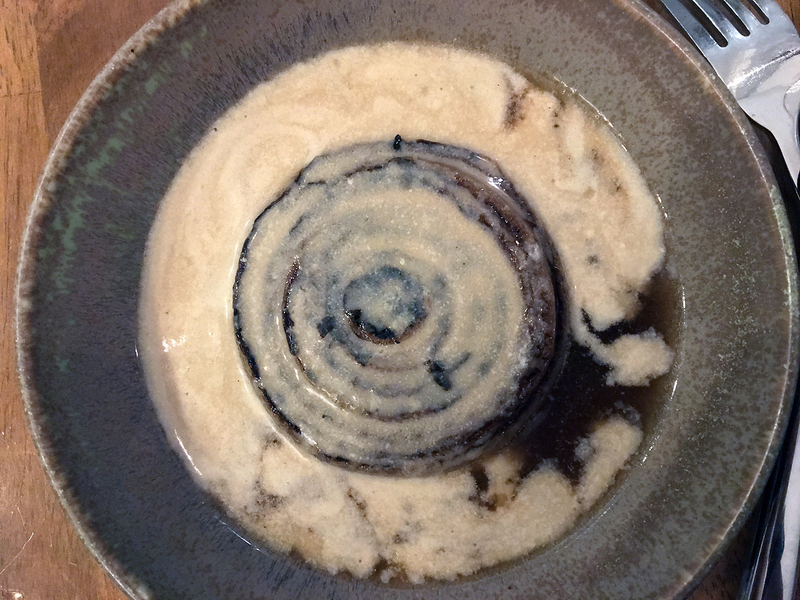 ‘Onion and cheese’ was effectively a reimagined French onion soup. Liquid cheese was poured by a waiter into a modestly moreish consommé with a whole top-and-tailed onion sitting in the middle. Although each element was meek when taken in isolation, together they were greater than the sum of their respective parts. The sharpness of the slippery coils of onion was neatly boosted by the lactic sharpness of the cheese, the consommé blunting and rounding it off so it never became overwhelming. The anti-Instagramness of this dish is one of the most appealing things about it. 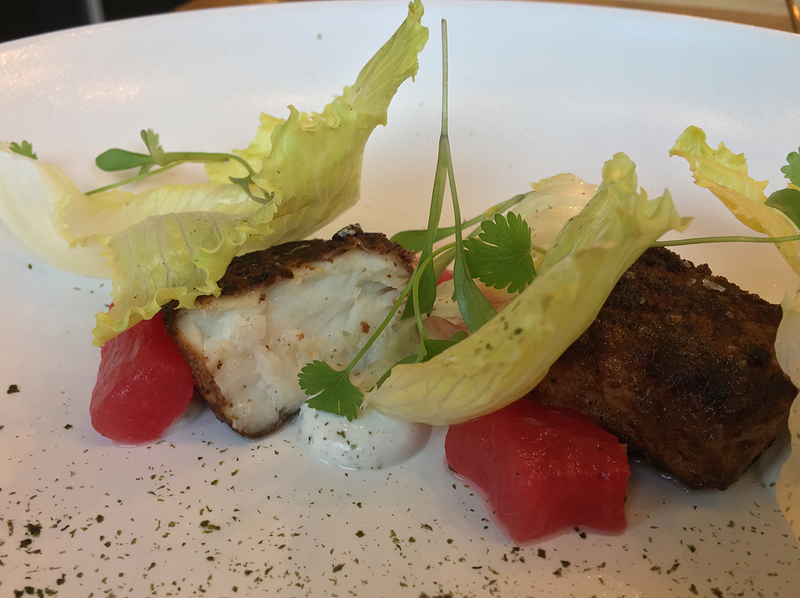 Although the mackerel was just right texturally – smooth and neither too soft nor too firm – the room-temperature fish was surprisingly devoid of character with none of its distinctively bold taste. Even the accompanying XO sauce was tame with only a faint umami and spicing. 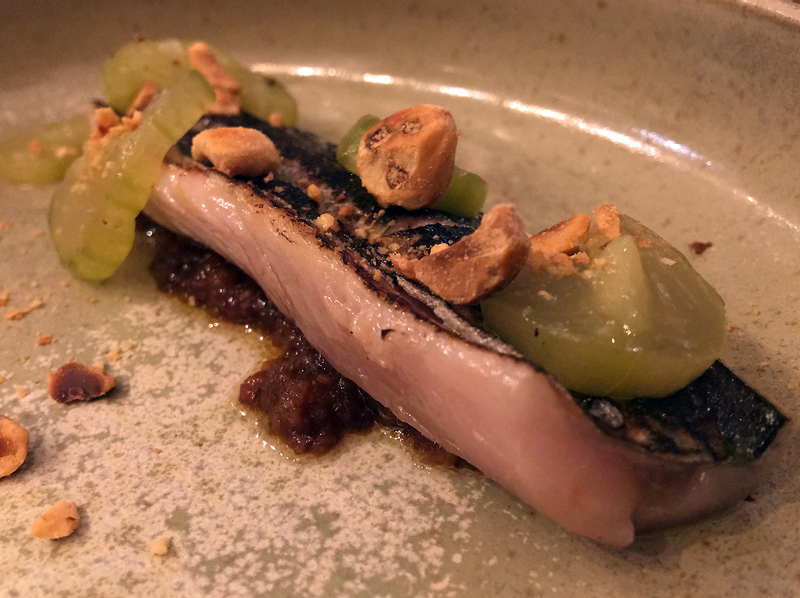 The surprisingly complimentary pairing of crunchy hazelnuts and tart pickles livened things up a bit, but this dish was ultimately disappointing. The ‘ice cream sandwich’ looked more like an inverted parfait than a traditional ice cream sandwich. The strawberry sorbet perched on top of it all fell into uncanny valley territory, coming close to the taste of the fruit but was ultimately unconvincing. The salted caramel ice cream sitting underneath it, while tasting of no such thing, was ultimately more satisfying. It came encased in a nutty dusting which gave it a taste heavily reminiscent of peanut butter. Come with me to the The Upside Down. 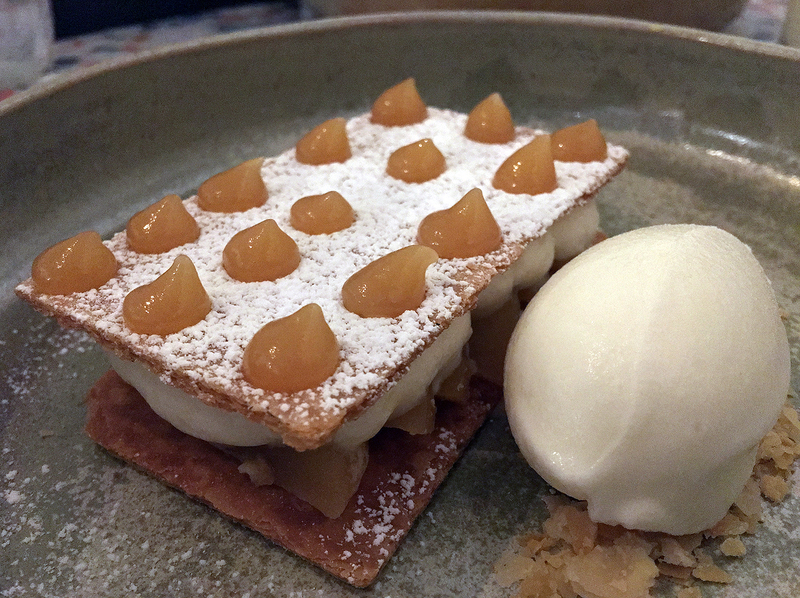 Delicately sweet and yielding pears came sandwiched in between thin puff pastry wafers that were impossible to eat without scattering snapped shards of pastry everywhere. It wasn’t really needed anyway – the tart, smooth and refreshing yoghurt sorbet was a fitting accompaniment to the pears and didn’t need any support. The bread-to-filling ratio of the smoked haddock and leek toastie was heavily tilted in favour of the buttery doorstop of brioche. 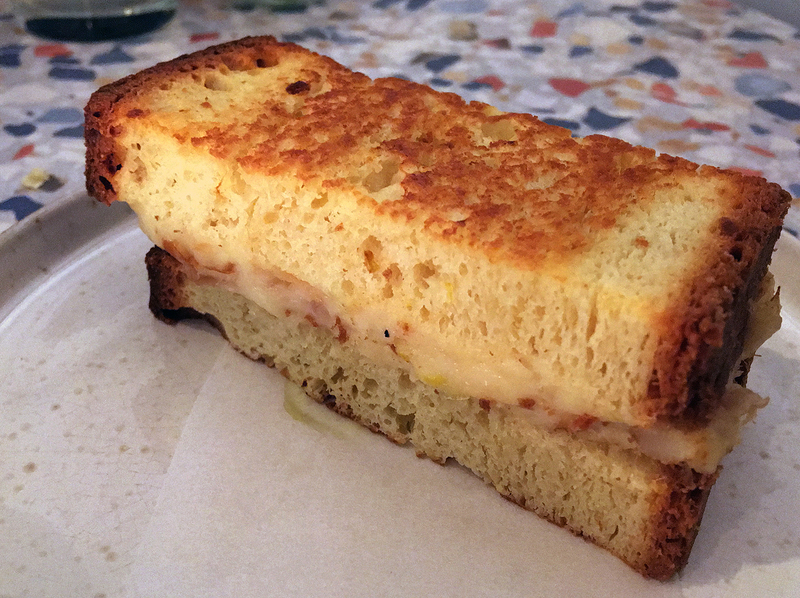 There was still plenty of joy to be had in the smoky, salty, gooey filling – I just wish there had been more of it. I spend many of my waking hours eating sandwiches. And some of my non-waking hours, to be fair. Although not as sumptuous as the lamb sometimes available at Brat, the meat medallions here were nonetheless superb in their dense texture and delicate sweetness. The apt accompaniments were all finely executed from the the sweet, starchy artichokes to the smoked cod roe cream and the powerfully umami olive dust. Smearing the latter two all over the lamb, cooked rare and thus appearing redder than my slapped arse, made the meat taste like smoked gammon which was both delightful and laughably surreal. When I say ‘smoked gammon’, I’m obviously not referring to the Question Time variety. The potato ‘spaghetti’ was actually a trio of thick, sweet and starchy potato pucks drenched in a richly eggy, creamy sauce. 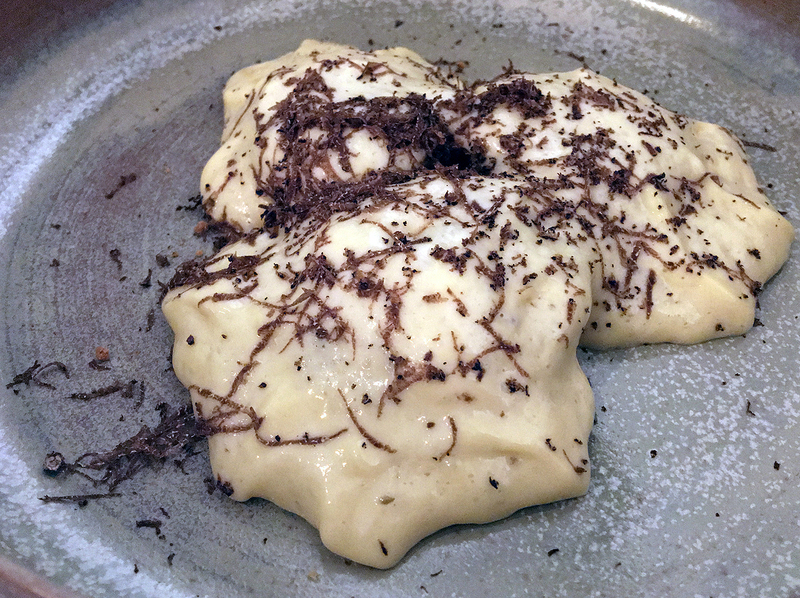 Although comforting enough in its own right, the main appeal for me turned out to be the beguilingly sweet, earthy aroma of shaved truffles. I’m guessing from the name that this dish is supposed to be a vegetarian-friendly reimagining of a spaghetti carbonara. 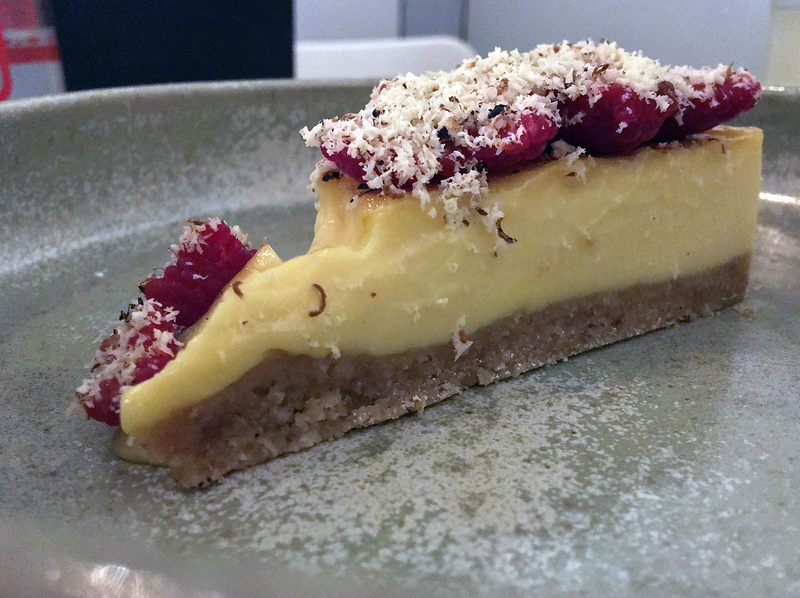 The eponymous filling of the toasted oat custard tart had an oddly medicinal, vaguely aniseedish flavour that was deeply unappealing and detracted from the charms of the loose-crumbed pastry. 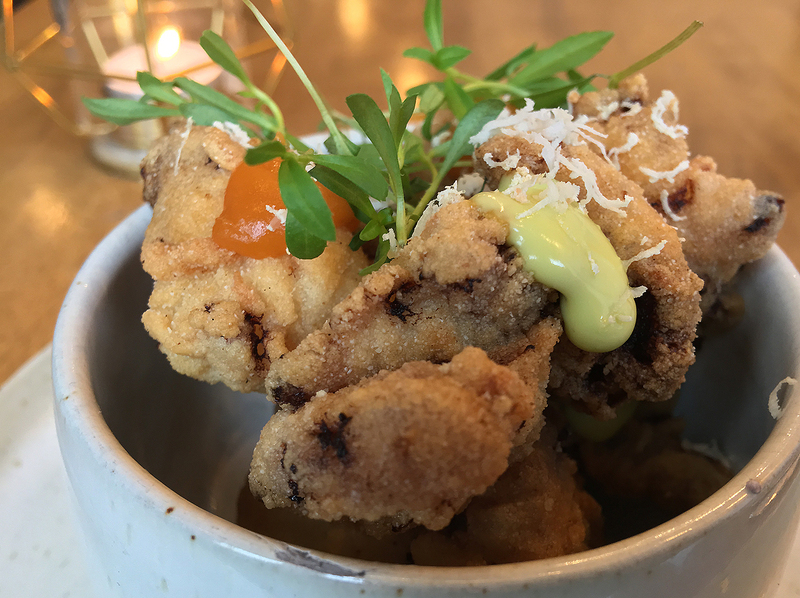 Considering that 1251 has such an experienced chef at the helm, the food was surprisingly uneven with some unbalanced dishes and even the occasional dud woven in amidst some delightfully delicious blockbusters. There is clearly an immense amount of skill and verve in the kitchen – it just needs a little more focus and finesse. Perhaps, one day, 1251’s execution will be consistently good enough that Cochran can slap his name proudly on the sign (if he’s ever allowed). But that day isn’t today. Not yet. Opening Hours: Monday-Saturday 11.00-23.00. Sunday 11.00-22.30. Total cost for one person including soft drinks: £60-70 approx. 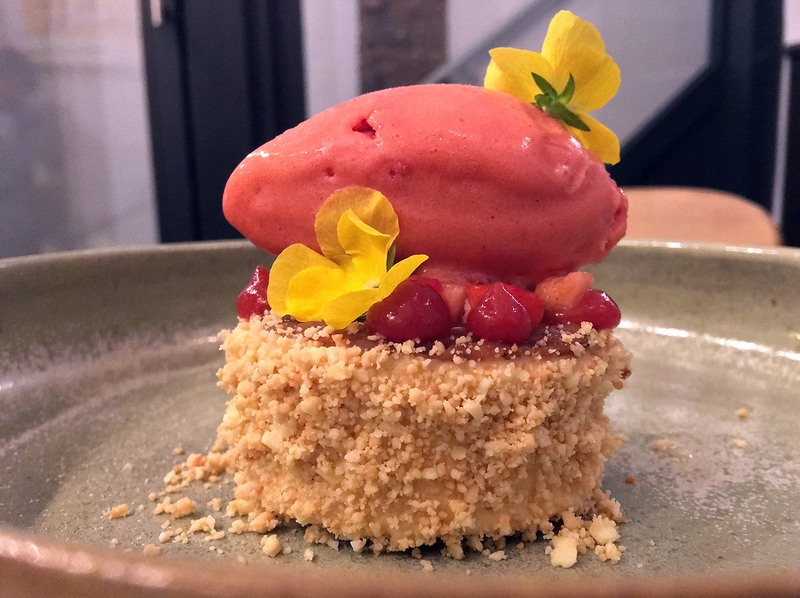 Tags: 1251, almond, cauliflower, cherry, custard, eel, haddock, ice cream, james cochran, lamb, london, mackerel, meringue, pickles, pork, potatoes, rabbit, restaurant, review, sorbet, soup, tart, toast. Bookmark the permalink.